KINSALE, Ireland - The classic links courses of Ireland are what most Americans have in mind when they jet over the Atlantic for a golf holiday. 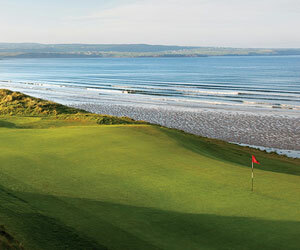 The fabled names of Ballybunion , Lahinch, Waterville and Tralee on the southwest coast, or Royal County Down and Royal Portrush on the northeast coast are among the names that stir the imagination. But I'm here to tell you that antiquity is far from the only prerequisite for a superb golf experience in Ireland, and a course need not date from the 19th century to be well worth a visit. A pair of aces comes to mind posthaste when discussion turns to the "new classics" of the Emerald Isle. Old Head and the European Club might not have been laid out with pick, shovel and mule power like their bett er known and more prestigious forbearers, but they are thrilling and provocative golf experiences nonetheless. The Old Head Golf Links is as spectacular a piece of terrain as exists in the entire golfing world. The course, which opened in 1997, is found on the southern tip of the island in County Cork, perhaps a 15-minute drive from the village of Kinsale. The property itself is a 220-acre diamond of land that juts out more than two miles into the Atlantic Ocean. From ground level the site is unforgettable, but arriving by helicopter, which we were fortunate enough to do, showcases a landscape astonishing in scope. Zooming in over the sea, we approached a promontory of land guarded by jagged sea cliffs rising more than 300 feet from the water. Numerous caves and inlets pockmark the lower portion of the cliffs, while acres of native fescues and shimmering wild grasses wave in the wind at cliff top. Just the scope of a bird's eye view is enough to make the pulse pound. The drama increases exponentially once a player takes club in hand and The Old Head peninsula is wet, wild and windy. On a rare bluebird day the setting is magically beautiful. The dignified lighthouse, ancient castle ruins, ocean, whitecaps and dizzying cliff-side views all conspiring to sap the concentration of golfers. Or the fog can roll in so intensely that players must literally be lead off the course individually by the caddies back to the spacious and well appointed clubhouse, or risk plunging headlong off of an unseen precipice. One never can tell. One of the raps on Old Head is the course isn't nearly the equal of the setting. Balderdash, I say. First of all, I've yet to see any golf course that can compete strategically on the same level that Old Head dazzles the senses. So it's a given that the course routing and strategic interest can only suffer by comparison. But the fact is that Old Head has close to a dozen fantastic holes, holes that would stand out in any locale, not just one that happens to feature raging seas beating against towering rock. The quintet of par-3s are all wonderful, albeit terrifying, and the 12th is among the most dazzling par-5s I've ever seen. At some 550 yards, it features a dry-mouth tee shot that must carry the edge of the cliffs to a tumbling fairway, a cautiously executed second, and a tricky short iron to a seamlessly shelved green tucked back into the hillside. It's probably the best hole on one of the most unforgettable courses I've ever seen. Pat Ruddy is a former golf writer turned course architect, and his love of the game so strong he actually devised a 20-hole loop, as opposed to a traditional 18. His rationale is simple, and helps to partially explain why the European Club is so revered by the cognoscenti who understand that antiquity and pedigree aren't mutually exclusive. "If there are 20 fine golf holes found on the land, why stop at 18? We are here to play golf!" Though his course is but a decade old, Ruddy is a traditionalist, taking great pride in the fact that his marvelous creation in a true links, one of perhaps 150 in the world. Courses like the European Club are so rare because they are built on that hard-to-find brand of firm, fast turf, the type of sandy deposits that link the beach to the inland soils. Here the ball runs hard and bounces capriciously, the bunkers are deep to prevent the sand from blowing away on the sea breezes, and the greens are quick and undulating. The round is full of highlights, but the best holes back to back have to be the twelfth and thirteenth, a par-4 and par-5 respectively. There are sea views throughout the course, but it is only here where one can actually lose a ball onto the beach itself. The local rule dictates the ball can be played as it lies, and most mercifully, a player may ground the club in the hazard. Thank heaven for small favors, and while you're at it, thank Pat Ruddy himself for having the insight and imagination to create this bravura golf experience.